Start off your visit on the 11th (Wed): get a dose of the wild on a nature and wildlife tour and then cast your line with a fishing tour. Get ready for a full day of sightseeing on the next day: stop by Alafoss Wool Store, explore the striking landscape of Thingvellir National Park, and then contemplate the waterfront views at Kerið. To see more things to do, photos, ratings, and tourist information, go to the Reykjavik travel route planner. Hyderabad, India to Reykjavik is an approximately 18-hour flight. The time zone difference when traveling from Hyderabad to Reykjavik is minus 5 hours. Traveling from Hyderabad in September, things will get cooler in Reykjavik: highs are around 13°C and lows about 7°C. Wrap up your sightseeing on the 12th (Thu) to allow time to travel to Akureyri. Start off your visit on the 13th (Fri): see majestic marine mammals with a dolphin and whale watching tour, look for gifts at Flora, Akureyri, and then take in the dramatic scenery at Godafoss. Get ready for a full day of sightseeing on the 14th (Sat): see the top attractions with Sightseeing Tours. To find maps, photos, and more tourist information, go to the Akureyri day trip app . Getting from Reykjavik to Akureyri by flight takes about 2.5 hours. Other options: do a combination of bus and flight; or drive. In September, plan for daily highs up to 13°C, and evening lows to 5°C. Cap off your sightseeing on the 14th (Sat) early enough to go by car to Reykjahlid. Step out of the city life by going to Krafla Lava Fields and Lake Myvatn. Step off the beaten path and head to Dettifoss and Mt. Namafjall (Namaskard). The adventure continues: witness a stunning natural landmark at Hverarond, head outdoors with Vindbelgjarfjall, take in the dramatic scenery at Hverfjall, and take in the dramatic natural features at Mud Pots. To find photos, maps, more things to do, and other tourist information, go to the Reykjahlid trip planner . Drive from Akureyri to Reykjahlid in 1.5 hours. Alternatively, you can take a bus. September in Reykjahlid sees daily highs of 13°C and lows of 5°C at night. Cap off your sightseeing on the 17th (Tue) early enough to travel to Vatnajokull National Park. Vatnajökull National Park is one of three national parks in Iceland. Kick off your visit on the 18th (Wed): explore the wealth of natural beauty at Skaftafell National Park. Here are some ideas for day two: take in the dramatic natural features at Svinafell Glacier, explore the activities along Lac Polaire, and then admire the sheer force of Svartifoss Waterfall. To find traveler tips, more things to do, maps, and more tourist information, go to the Vatnajokull National Park trip itinerary planning website . Explore your travel options from Reykjahlid to Vatnajokull National Park with the Route module. In September in Vatnajokull National Park, expect temperatures between 13°C during the day and 8°C at night. Finish your sightseeing early on the 19th (Thu) so you can take a bus to Kirkjubaejarklaustur. 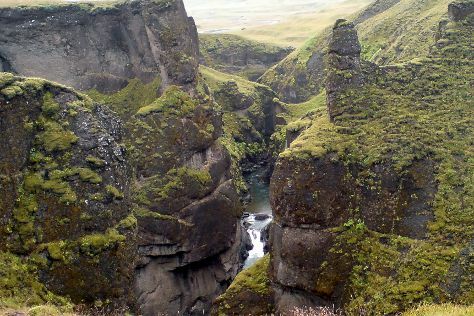 Start off your visit on the 20th (Fri): explore the striking landscape at Skaftareldahraun, admire the sheer force of Stjornarfoss, then admire the sheer force of Systrafoss, then contemplate the geological forces at Skaftarstofa, and finally explore the stunning scenery at Fjadrargljufur Canyon. To see maps, ratings, reviews, and tourist information, you can read our Kirkjubaejarklaustur tour itinerary builder tool . You can take a bus from Vatnajokull National Park to Kirkjubaejarklaustur in 3 hours. Cap off your sightseeing on the 20th (Fri) early enough to go by car to Vik. On the 21st (Sat), take in the dramatic natural features at Mýrdalsjökull, hike along Sólheimajökulll, then explore the striking landscape at Dyrholaey, and finally stop by Wool Gallery Vik i Myrdal. Here are some ideas for day two: enjoy the sand and surf at Reynisfjara Beach, kick back and relax at Black Sand Beach, and then take a pleasant ride with a tour on horseback. To see other places to visit, maps, more things to do, and more tourist information, go to the Vik trip builder tool . You can drive from Kirkjubaejarklaustur to Vik in 1.5 hours. Another option is to take a bus. 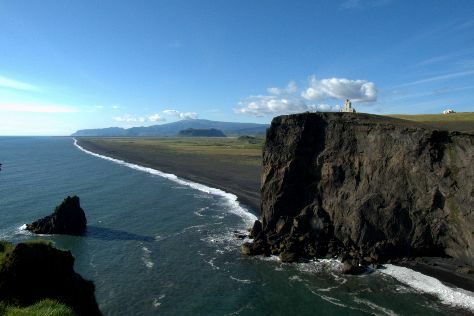 In September, daily temperatures in Vik can reach 11°C, while at night they dip to 9°C. Wrap up your sightseeing on the 22nd (Sun) to allow time to drive to Blaskogabyggd. Start off your visit on the 23rd (Mon): take in the dramatic scenery at Gullfoss, then witness a stunning natural landmark at Strokkur, then take in the natural beauty of Haukadalur, and finally take in the dramatic scenery at Faxi (Vatnsleysufoss) Waterfall. To find where to stay, reviews, traveler tips, and other tourist information, read our Blaskogabyggd online trip itinerary builder . Drive from Vik to Blaskogabyggd in 2.5 hours. Alternatively, you can take a bus. Expect a daytime high around 13°C in September, and nighttime lows around 7°C. Finish your sightseeing early on the 23rd (Mon) to allow enough time to travel back home.